WANTS AND NEEDS are concepts that have come to be developed around three different spheres of discussion, biological, social, and economic. Each is an expansion in size and scale over the one preceding it. In addition, it is important to remember that the subject is biological in character. This means that we do not discuss the wants and needs of inanimate things. The second important point to recognize is that “wants” are subservient to “needs” and, as far as we know, restricted to the realm of humans. 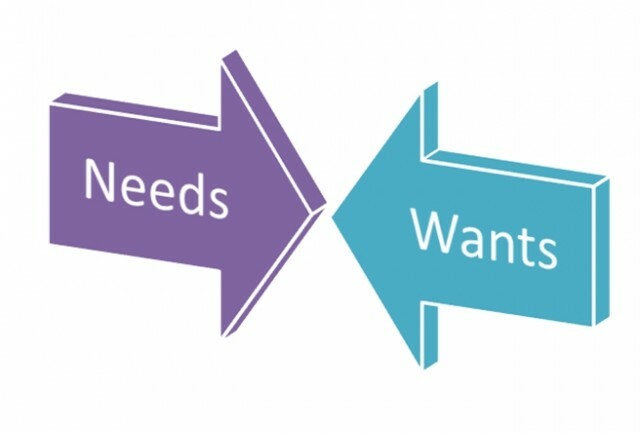 From this perspective, we can think of wants as some specific expression of how we choose to meet those needs. The discussion of wants and needs has an origin in Greek thought more than 2,500 years ago in works by Xenephon, Aristotle, Plato, and Protagoras. But their discussion of the issue was fairly broad and aimed primarily at what constitutes good administration as the driving force in society. However, Protagoras did make a distinction between human perception and physical phenomena, stressing that hedonic calculus (self-interest) is a vital element in individual decisions. These ideas held for more than 1,200 years until the subject was once again discussed at length during the Scholastic Period beginning in the 1200s. Here, the writings of Albertus Magnus and Thomas Aquinas began to explicitly explore what they called indigentia, or human wants. But the writing was vague in the sense that the distinction between wants and needs was far from clear. At the end of the 18th century, the Classical School of economic writers once again found room for wants and needs in their writings. But the development of economic ideas during this time considered human wants and needs to be insatiable (and generally identical), and as such, the real interest was in finding ways to economically balance unlimited wants with limited resources. The importance here is that the reference to limited resources marks the first time that geographic factors are openly included as an important element in the wants and needs discussion. During the 19th century all forms of science began to blossom, including psychology. One of the areas of development within psychology was a new examination of human need. Psychologists quickly established certain primal needs such as those involving physiology: the need for food and shelter, where food also includes drink and where shelter can refer to clothing, housing, or other individuals. By the mid-20th century a wide variety of needs were being identified and debated, but they were generally related to biology, achievement, or power. Probably the most well known of these were put forward by Abraham Maslow (1943). Maslow developed a conceptual framework that suggested a hierarchy of human needs addressing issues as either growth needs or deficiency needs and where each lower-level need must be meet before the one above it can be fulfilled. If you review all that has been discussed, you will find that most of the discussion can be put into one of two boxes, things that are instinctive and things that are learned responses. In doing this, the differences between needs and wants not only becomes much clearer, but it is possible to extend the thinking to areas beyond the biological and make use of the ideas within a geographic context. Instincts are hardwired into the brain, the genetic legacy of millions of years of evolution. Instincts make a creature react automatically to stimuli, with the brain carrying out instinctive reactions without conscious control. But we must not think that instinct is fixed. There can, of course, be evolution in instinct. On occasion an aberrant instinct can be more efficient as a survival or reproductive mechanism than the original instinct. Thus, the aberration has a better chance of survival, of reproducing, and of passing on to future generations, the original instinct dying out. The second element of the subconscious mind is learned response. A learned response is one that mitigates or modifies an instinctive reaction. It is instilled in a person through a series of steps: emotions, belief, attitude, feelings, and behavior. Emotions, loosely defined as feelings, are the result of two things: the instincts discussed earlier and a priori assumptions. A priori assumptions are those conclusions based on theory rather than experience or observation, premises arrived at without examination of evidence. The basis for a priori assumptions is culture and upbringing, what sociologists call socialization or programming. Basic instructions on how to regard the world first come from the family. In human terms, programming tells one how to regard what comes in through the senses. The family is not the only source of programming, of course. As a person gets older, other influences come into play: school, church, peers, teachers, television, books, anyone and anything that provide ways of regarding the world and the people in it. Programming leads to belief: what a person is programmed to believe is what that person does believe. What leads from a person’s beliefs is that person’s attitude toward the world and the things in it, the next step in learned response. When one believes something is bad, the attitude toward it is one of distaste. The attitude leads to the next step: feelings. Feelings are the actual human emotions that result from the instinctive and learned response reaction to a stimulus. On the basis of feelings, humans respond. Their initial response is to their instinctive reaction to stimuli. However, this is coupled with their learned response and becomes their behavior. Actual behavior is the final level. It is what people do in response to a stimulus, the external manifestation of their attitudes. Each of the points indicated above suggests the geographic character of the wants/needs issue. We can take needs as given and apply them anywhere we want. Wants, on the other hand, are socially determined and as such reflect the degree to which the geographic environment (our physical and cultural surroundings that provide the basis for our emotions, beliefs, attitudes, feelings, and behavior) gives specific meaning to satisfying needs. While we accept human need as uniform among all people, the world’s resources for satisfying them are not equally distributed among regions. This difference is what often leads to stereotyping and sometimes conflict. It is also a strong driving force behind territoriality, a key factor in GEOPOLITICS and the game of nations.